When South West Ag Partners (SW ag) surveyed the challenges ahead for their growers in Ontario, Canada they saw an increase in government regulations and environmental issues. As they began to position themselves to help growers tackle these pending issues, they developed Sustainable Cropping Systems, a new suite of offerings designed to help growers address pending challenges. SW ag’s Sustainable Cropping Systems incorporates four core areas: tillage equipment, agronomics, precision agriculture services, and custom application of nutrients for individualized cropping recommendations. At the center of the program is the SoilWarrior® strip-tillage machine. Strip-tillage offers the advantage of minimum tillage while strategically placing nutrients in the root zone where they are readily available to the growing plant. “We are excited to bring this equipment to our customers,” says Rick Youlton marketing manager for SW ag. “With our custom applicator service our customers can take advantage of the benefits of reduced tillage without incurring the individual investment in equipment. SW ag launched their new initiative at a demonstration day on July 30th in Chatham. 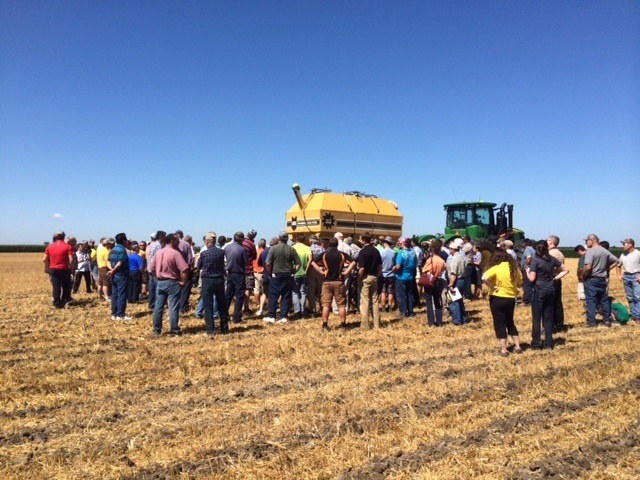 Nearly 200 interested growers attended the invite-only event to see the SoilWarrior® in action and learn about the new sustainable cropping systems offerings. Coupling the custom application with the precision agriculture services offered through the SW ag’s affiliate VERITAS, gives growers the ability to strategically manage their cropping enterprise using GPS satellite technologies, variable rate planting and fertilization equipment, and yield monitoring. “Farmers today have access to high-level technologies to help them effectively manage their land and their crops. As their agronomy partner, SW ag strives to keep pace with advancing technology to continually meet their needs,” Youlton says. The SW ag agronomy team, led by David Page, had been researching the use of strip-tillage in cropping management systems and knew it could work for their growers. They also realized that asking growers to change tillage practices requires a commitment of resources many would not be willing to invest in until the practice was validated in their growing region. Through their research, they came across Environmental Tillage Systems’ (ETS) ag retailer program and decided it was the best way to introduce the opportunity. “We are working with ETS over the next 18 months to see the capabilities of the machine and how strip tillage works in our area. At the end of the 18 months we may send the machine back, or we may have five more sitting here to meet demand. We will see how our growers respond,” Page says. In addition to the ag retailer program, Page was impressed with the power and design of the SoilWarrior®. The use of coulters instead of shanks and the ability to precisely target nutrients in the zone were benefits that gave the machine advantages over the competition. “When we saw it in action last spring we were impressed with its ability to work through various field conditions and the way it handled residue. We have a lot of corn on wheat in our area and we need tillage equipment that can go through tough conditions,” says Page. In addition to bringing in the equipment and services, SW ag has enlisted the expertise of Canadian agronomist Peter Johnson to work with the SW ag team conducting field trials and sharing information with interested growers. Johnson’s reputation and past experience with managing various cropping systems makes him an ideal fit for the SW ag project. The SW ag team will be attending various grower events in Ontario through the summer and fall to sign growers up for the research projects and custom application service. They will be sharing their findings with growers throughout the program. Learn more about protecting your farm's future with Sustainable Cropping Systems. 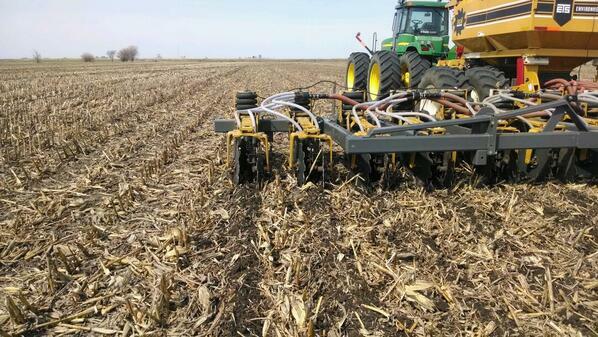 Interested in discovering the benefits of the SoilWarrior® and reduced tillage for yourself? Download our FREE ebook.